1. Litter – Pupils/parents/teachers/volunteers have been working hard to reduce litter, not only in our playground, but also in our local community. We have been learning about the Sustainable Development Goals and have been learning about ‘Life Below Water’. The pupils would like to reduce plastic pollution and help protect marine life and have organised the local clean up with the community. 2. School Grounds – It was decided that we wanted to transform part of our playground for outdoor learning and to connect our pupils to nature. First, we contacted the ‘Community Pay Back Scheme’ to ask if they would help us to make a plastic bottle greenhouse and some raised beds. The Eco-Committee sent out a request for parents to collect their plastic bottles and send them into school. Since the initial request, we have collected approximately 1400 plastic bottles for our greenhouse which is now proudly erected in our playground. The Eco-Committee and gardening club have grown fruit and vegetables in their Eco garden (including apples, pears, plums, potatoes, tomatoes, carrots and herbs). 3. Waste Minimisation – The Eco-Committee have taken responsibility for reducing waste. They have introduced food caddies to each class and request that all fruit waste be put into these caddies. Once or twice per week, the Eco-Committee collect this fruit waste and take it up to our Compost Bin in the Playground. 4. Bio-diversity – The Eco-Committee/Gardening Club are interested in promoting bio-diversity. The gardening club prepared an area of ground at the top of our playground and planted a wildflower meadow to promote bio-diversity in our playground. The pupils also created a large Mini-beast Hotel. 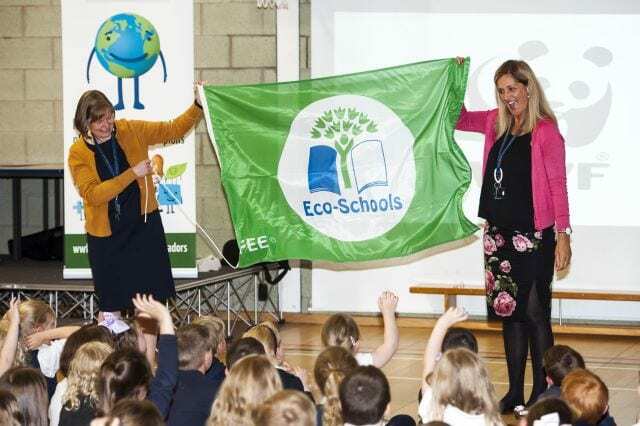 Stobhill will be flying their green flag high and proud in the next couple of weeks and propose to have a launch party to celebrate their success, to which they have invited Jim Muirhead, local Councillor, to the occasion.